Risalamande is a traditional Danish rice dessert based on rice, cream, and almonds served with hot cherry sauce. 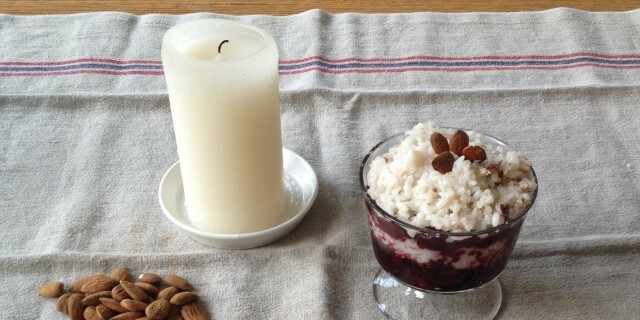 It’s basically rice pudding with almonds and a cherry sauce. 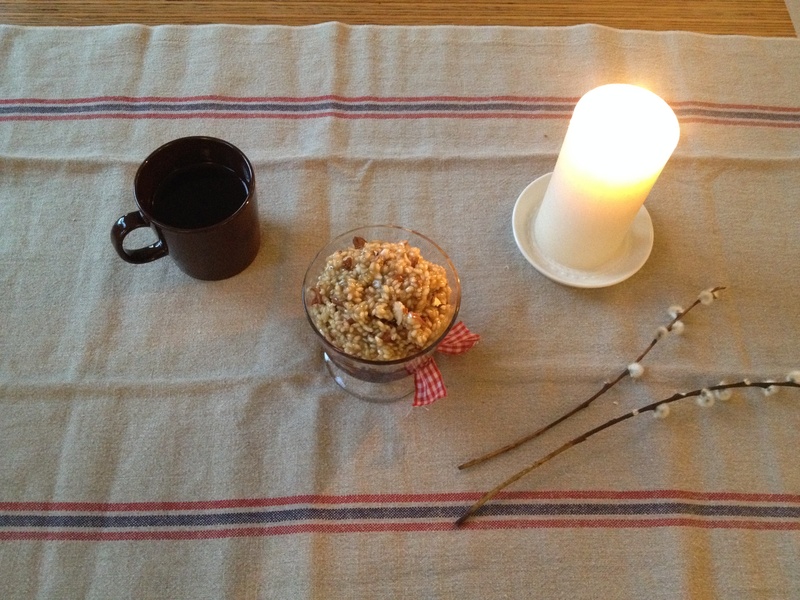 Risalamande is typically enjoyed at Christmas time in Danmark but it makes a great breakfast or dessert too. I was inspired when I saw a version of a healthy risalamande come by on the Instagram of @Annaeiholm. You can find her recipe here. It’s usually made with dairy. Anna’s Risalamande looked so delicious that I decided to create a dairy-free version for those of you out there who are sensitive or intolerant to dairy. While I was making it, my whole kitchen filled with the lovely sweet aromas of the coconut rice milk, vanilla and warm cherries. It smelled so good that I could hardly wait to dig my spoon into this dessert. The coconut rice milk works really well with the rice. It’s naturally sweet and as the sweet rice boils and releases its starches, it thickens and caramelises giving the rice pudding a lovely caramel-ish sweetness. I have made two versions of this dish so far. One with standard white dessert rice and one with a sweet, unrefined rice from Terrasana. Although the white dessert rice requires less cooking, I loved the one with the unrefined sweet rice best. It has an almost nutty flavour and it does not get mushy. If you like a traditional sticky and mushy rice pudding though, I suggest you go for the white rice. If you like a little of bite and some heartiness, I suggest you go for the sweet rice. It has a fuller flavour and retains its shape. To make the rice pudding, add the sweet rice to a small sauce pan and pour in the coconut-rice milk. Add 1 tsp of vanilla powder and bring up to a boil. Turn down heat and allow to simmer, stirring every once in a while. Cook the sweet rice for 40 minutes and the white rice for 10 minutes. Add coconut milk at the end and allow to simmer for 10 more minutes or until all liquid has evaporated. When done, remove from heat and allow to cool down. To serve, mix the chopped almonds into the rice porridge. Pour the hot cherry sauce on top and enjoy!